Pull up a chair and help yourself to a slice of cake because this is one Tea Party you do not want to miss! With 30 Pay lines, up to 50 Free Spins (where wins are doubled), an extra Free Spin wild symbol and an on-screen Bonus, this party is a definite win. Look out for the Mad Hat on the 3rd reel as this brings a little extra magic to the table…Expanding Wilds mean more chances of more wins and of course, more fun! 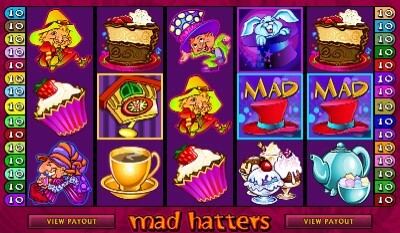 So, get to know the funny and cute characters a little better, and enjoy the rewarding wins because Mad Hatters Video Slot most certainly lets you have your cake and eat it! Mad Hatters is a 5-reel, 30 pay line Video Slot which offers Free Spins (where Wins are doubled), an additional Wild Symbol during Free Spins and an On-Screen Bonus Game, as well as the Expanding Wild feature. COME JOIN LUCKY NUGGET CASINO'S CRAZY TEA PARTY! Here's a major new video slot that you won't want to miss, so get set to party on with the Mad Hatter and his buddies on the exciting 5 reel, 30 pay-line MAD HATTERS game now available at LUCKY NUGGET Casino. This is a nutty tea party with a difference, where with a little luck and good interactive judgment you really can have your cake and eat it! It's a game with several unique "firsts" for online gaming; check out the different ways to win on more pay-lines and up to 50 free spins, and the innovative Extra Wild and Expanding Wild features! Let's take a look at those ways to win in more detail. First, look out for the crazy cuckoo, because 3, 4 or 5 of this little guy on adjacent reels activates an on-screen bonus feature where you can choose three out of five birds and add the wins to your pay-line rewards. And those wins can be pretty insane - up to 11 100 coins. Next, hope for the rabbit in the magician's hat that is our Scatter symbol, because 3, 4 or 5 of these across the reels activates the free spin function where you can rack up the most free spins ever in a game on the Internet... up to 50. Scatter wins are multiplied by your total bet, and wins within those free spins are multiplied by x2. See what we mean by many ways to win? But we're still not done here, because this game has a brand new feature you'll like, too – “Choose Your Extra Wild”. Talking about Wild, the big red top hat is another symbol you'll welcome, because its substitute powers can bring you up to 200 000 Coins. So, how do you love this game? Let us count the ways: We've got Wild, Extra Wild, Expanding Wild Scatters, lots of Free Spins with a multiplier and Bonuses. 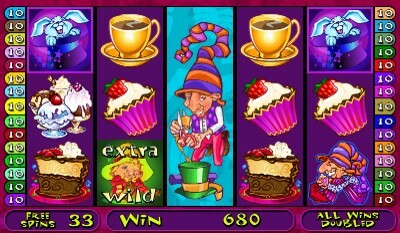 All of these help you add to that cashier cage bottom line, with up to 50 000.00 a possibility on the base game, another 100 000.00 achievable on the free spins multiplier and to top off this tempting cake, a bonus cherry of up to 2775.00. And there are plenty of lesser amounts to reap in between. Whether you play for as little as a cent or as much as the high roller maximum bet of 75.00, we’re confident that Mad Hatters will deliver hours of great entertainment. Backing the action on this dynamic and compelling new game is the Mad Hatter's Tea Party theme, presented through pinpoint sharp and brightly coloured graphics that introduce weirdly garbed guests, scrumptious pastries, fragrant teas and all manner of cute and mysterious figures. Now, it's time for you to accept this invitation to join the Mad Hatter's very rewarding party - at LUCKY NUGGET Casino, of course. Mad Hatters Video Slot at The Gaming Club Casino Open a new Real Account at The Gaming Club and you will get 100% free casino bonus to spin and win on fantastic range of slots games!